Time management and bees: who's keeping who? A local Denver community marketplace near me recently hosted an introductory beekeeping class given by Colin Mann from Vine Street Farms, which provides mentoring and beekeeping consulting service in my area. As I had been toying with the idea of becoming a backyard beekeeper, my family & I decided to make a night of it, and went to enjoy some pizza, beverage, and bees. I loved the idea of helping to provide for the needs of our honeybee neighbors and helping their population grow and thrive. And of course, having our own local honey to harvest and share with friends would be just a bonus. I had done my research, and much of what was discussed, I felt I had a good handle on. After all, I’d read The Beekeeper’s Bible. What I hadn’t counted on was how much work was involved in keeping bees. Work AND kids AND dogs AND house AND bees...having one more job to do just wasn’t in the books for our family. Which got me thinking...I was just worried about the work 1-2 hives would take. How much time and labor is involved in taking care of 100 hives… or 1000 or more? Well, according to Jamie Ellis’s article in the American Bee Journal, the answer depends on several factors: what beekeeping goals you have, what your available resources are, your local climate, how many folks are helping manage the hives, AND, most importantly, how many colonies you have. So many jobs to do: colony size needs to be managed, hive splits need to be made, and more supers need to be added. Pests & diseases must be prevented or treated. Is the queen in good shape? Do the bees need to be fed? Have they made enough honey to last the winter? It takes as much as 2700-3900 hours of work a year to manage 1000 hives. Most commercial beekeeping operations’ main source of revenue nowadays is in the pollination business. With this comes an even greater amount of labor, as well as drive time (which I sure as heck would consider labor!). So, hat’s off to the American beekeeper! They are some hardworking folks, doing their part in keeping a large part of the nation’s pollinators thriving, and trying to earn a living while doing so. ​The Bee Corp recently teamed up with Indiana University's School of Public and Environmental Affairs (SPEA) and their Data Science course to host our first-ever Bee Data Hackathon. If you've never heard the term before, a hackathon is an event where the sponsor provides participants with a problem and the resources to solve it. The challenge: How can beekeepers maximize honey revenue? The resources: A giant, messy file of bee data including historical honey prices, average honey yields in different regions, costs associated with transporting bees, and much more information (some useful, some intentionally misleading). Students were given just a few days to clean and analyze data to recommend the best locations to maximize honey revenue throughout the year. Students were scored based on how well they followed instructions, the logic behind their math, how well they cleaned the data, and how the data was displayed in a data visualization. Undergraduate and graduate students were split up to compete for jars of our honey and a feature on this blog. The students were given raw, uncleaned data with additional errors added by The Bee Corp Data Science team. The first step was to clean the data. Hive weight was used as a way to track honey flows, working off the assumption that a hive that weighs more is going to be filled with more honey. When moving bees to a new location, students were given labor costs of loading bees and the transportation cost per mile to determine if the move was worth it for the revenue gained from honey collection. Different premiums for different types of honey were not considered for this hack. ​Surprisingly, each team had different recommendations on where to move bees based on what they found in the data! Some teams recommended certain months that were best to move bees, while others split the data into quarters. Both a graduate student and undergraduate student team were awarded with honey for having the best hacks, and our company selected the undergraduate team as the overall winner for the blog. ​The team, consisting of Yin Zhan, Wanyu Wang, and Hongda Wang recommended starting the hives in Washington for the first quarter of the year, moving to Alabama for the second quarter, Texas for the third, and then moving back to Washington for the fourth quarter of the year. ​Their math was highly detailed, which won them a lot of points from the judging. They calculated the difference in honey collected in different areas and subtracted the cost of moving the hives to get the net benefit of moving the hives for honey flows. Check out their visualizations above. 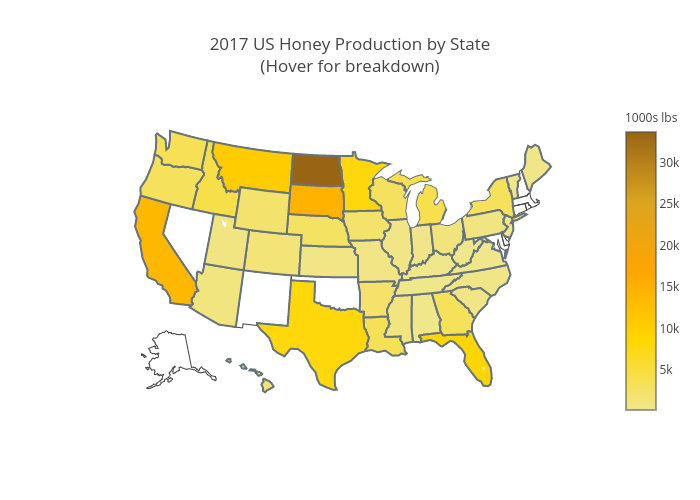 ​The USDA Honey Report for 2017 just came out this past month, and it offers up some really interesting insights about the industry. ​As a newbie to the beekeeping industry, this was quite a surprise to me. Bees and extremely cold winters... I didn’t think that was a good mix! But the Dakotas’ summer climate is optimal for nectar secretions for many of the flowers visited by the honeybees. Plus, the area is one of the last habitats that is not being extensively farmed, leaving room for the forage the bees need. Another surprise was the high price of honey in New Jersey. With an average of $7.86/lb, New Jersey honey is more than 3x more valuable than the national average of $2.15/lb, and more than 1.3x more valuable than the next highest-priced state (Virginia, $5.73/lb). What’s going on in New Jersey? Could this be due to the strict regulations on beekeeping taking place in the state recently? Now, if any of us have ever had the opportunity to go to Hawaii, it’s usually to bake in the sun for a relaxing holiday. But our dear friends, the Hawaiian honeybees, aren’t taking much of a break. Hawaiian bees generate the highest yield per hive in the country, more than 2x the U.S. average, in large part because of the year-round available forage for the bees. What other insights can be derived from this and past years' reports?  Stay tuned, as I go for a deeper dive in posts to come!